President Obama recently called upon the Federal Communications Commission (FCC) to use its authority to pre-empt state laws restricting municipal broadband. At least 19 states have laws prohibiting cities from constructing municipal broadband networks providing Internet access for businesses and citizens. Tom Wheeler, Chair of the FCC and a former telecommunications industry executive, has been publicly talking about doing just that for almost a year. On January 22 three Democratic Senators introduced the Community Broadband Act which would explicitly make it illegal for states to prohibit “public providers” (cities, counties) from offering broadband. But if municipal broadband is so great, why haven’t cities in the other 31 states been building broadband networks right and left? To be fair, some cities are building high-speed broadband networks, usually with fiber optic cable to every home and business. In Chattanooga Tennessee, the Electric Power Board – a rough equivalent of Seattle City Light – has built fiber broadband and is offering gigabit (one billion bits) per second service. In New York City, Citybridge, under the City’s authority, is replacing up to 10,000 payphones with free gigabit Wi-Fi hotspots which include free phone calls nationwide, tablet computers and charging stations. Tacoma, Minneapolis, Riverside (California), Lafayette (Louisiana) and even places like Cedar Falls, Iowa, have municipal broadband. Seattle has had an on-again, off-again, love affair with the concept of a municipal broadband network (and in full disclosure, I’ve led some of that effort). Now a local group is forming to push politicians to actually make it happen, although that campaign still lacks a name. UPTUN (Upping Technology for Underserved Neighborhoods) has long advocated for fiber broadband networks for Beacon Hill, the Central Area and nearby neighborhoods. But, for most places in the United States, including Seattle, municipal broadband is like a shining city on a distant hill: alluring and inspiring yet distant. Implementing municipal broadband is not simple or easy. In fact, the path to municipal broadband is strewn with a whole series of landmines and gotchas similar to the “simple” idea of tunneling a freeway under downtown Seattle. People are attracted to government-owned and operated broadband networks primarily because the incumbents are so roundly despised. The cable companies continually raise their rates. Comcast’s rates have risen 50% faster than inflation since 1996 according to Mark Cooper of the Consumer Federation of America. People hate their customer service, as well – the 2014 American Customer Satisfaction Index (ACSI) rated Comcast, which serves most of Seattle, as the “worst-rated company in the worst-rated industry”. Well, that isn’t exactly true. Time-Warner Cable was rated worse than Comcast, but Comcast is proposing to buy Time-Warner, perhaps to cement its bottom ranking. Telecommunications companies like CenturyLink provide some competition for the cable companies in Internet service provision. But the ACSI rates CenturyLink, AT&T and Verizon only slightly above the cable companies. It is an amazing situation when private citizens demand government get into competition with private companies to improve customer service and lower prices. Wired broadband is a natural monopoly. 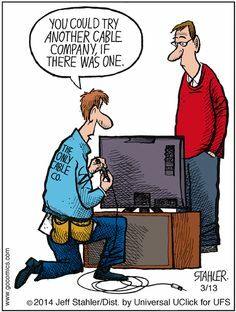 “You could try another cable company if there was one.” Jeff Stahler, 2014. It is expensive to run fiber optic cable to every home and business, just as it is expensive to run gas, water, sewer and electric lines. Most local governments either provide such monopoly services themselves, or heavily regulate the private providers, including regulation of rate increases. But the Federal Telecommunications Act of 1996 prohibits local or state regulation of Internet service. While the law does allow local or state government regulation of cable television, it severely restricts that authority. Local cable franchising authorities, for example, can only regulate the most basic, lowest cost, tier of service. Municipal Broadband would be as “natural” as municipal ownership of sewer, water or other utility services. The cable industry has abused its monopoly. Susan Crawford, former technology adviser to President Obama, describes how, in 1997, the cable companies met and decided not to overbuild each other’s systems, cementing the monopoly on cable in most areas. Comcast has purchased a number of other cable companies – including the pending purchase of Time Warner – further cementing its monopoly and profitability. Comcast also has purchased a lot of the content delivered over cable TV channels and the Internet. It owns or partly owns NBC Universal, Oxygen, MSNBC, History, PBS Kids, Sprout and many more producers of programming. While all of this is legal, the continued concentration of cable networks and content leads to rising rates. A municipal broadband network would be governed by the local elected Mayor and city council, rather than a board of directors in a faceless corporation in a distant city. Municipal broadband is good for the economically disadvantaged. A municipal network – controlled by elected officials – could offer discounts and other special services to low income residents, or for children in school, thereby reducing the digital divide and improving economic opportunity. Competition is good. If several different service providers offer any service, customer service should improve, rates should drop, and Internet speeds should increase. We’ve seen this already, as Comcast’s rates in Tacoma are lower due to the presence of Tacoma Click (although Click! loses money). Comcast has increased the speeds of its internet service, perhaps because CenturyLink recently announced it will provide fiber broadband to certain locations in Seattle and elsewhere, and Wave Broadband is also offering gigabit service. Theoretically, municipal broadband would have lower rates. A municipal network would not have to make profits, pay shareholders and pay exorbitant executive salaries. Comcast’s CEO Brian Roberts made $31.4 million in 2013. CenturyLink’s Glen Post made almost $9 million. Comcast’s part-time directors made $173,000 each. Seattle Mayor Ed Murray makes less than $184,000, and Seattle City Council members make less than $118,000 each. Municipal networks would be higher speed and have fewer technical problems. Cable company networks typically are fiber optic cable to each neighborhood, with older coaxial cable down streets and alleys and into each home or premise. Coaxial cable has connectors, is made of copper (which rusts), and can be decades old, all factors contributing to poor signal quality and technical problems. Telephone companies usually deliver their DSL broadband over copper wires with similar kinds of technical problems combined with lower speeds. In contrast, a new network – such as those in Chattanooga, Lafayette and Cedar Falls (but not Tacoma) – would be fiber optic cable throughout. Fiber carries signals with light, not electricity, and is much more resistant to aging and technical issues. Municipal networks can serve other city needs. Municipal networks could support smartgrids for water and electric utilities, where all the transformers, meters, distribution centers and valves in those networks are both automated and managed via the network. 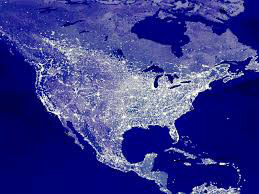 Smartgrids reduce repair times because outages can be quickly located to a specific location. Smartgrids also allow residents to control their costs because they can see their electric or water use in real time, minute-by-minute or appliance-by-appliance. This also supports municipal goals for conservation and reduction of climate change. But if municipal networks are nirvana, why aren’t they also sprouting like mosquitoes in a swamp? Incumbent internet providers would oppose cities tooth-and-nail. And they have deep pockets. Comcast has $5 billion cash on hand for lowering rates, advertising and legal expenses. A new network is expensive. Building a fiber optic network to every one of 320,000 homes, apartments and businesses in Seattle might cost $800 million or more. Now, that’s not much compared to the $4 billion price tag of Seattle’s ill-fated tunnel under downtown – and a fiber network would serve every home and business in the City, not just cars and trucks using the tunnel. And $800 million is roughly the equivalent of building a new football or baseball stadium. But getting voters to approve a $800 million bond issue. Legal challenges are certain. Lafayette had numerous challenges from Bell South and Cox (Cable) Communications, with both victories and losses in district and appellate courts, but ultimately prevailed in the Louisiana Supreme court after three years of litigation. Chattanooga did not have as much difficulty, but the Tennessee legislature passed a law limiting its ability to expand its $70 a month gigabit fiber service. Any major city which tried to implement a fiber broadband network must be prepared to litigate for years. And Mayors and City Council members would probably have to stand re-election during the legal battles. The business case for subscribers to pay network costs doesn’t work. A 2011 study conducted by the City of Seattle estimated a municipal broadband network – if supported solely by subscriber fees for television, Internet and telephone – might need to attract 50% of the subscribers from existing service providers. But a company like Comcast could use its huge cash reserves to cut its rates for Seattle customers for years, essentially starving the municipal network of operating capital until elected officials either gave up or were not re-elected. The lower rates would be great for consumers and businesses, of course. Other business models have political risk. There are other models – using a property tax or property assessment to supplement the income of the municipal broadband network. This makes good economic sense, as a high-speed broadband network in a high-tech city should attract technology workers from Amazon, Microsoft and other companies, improving property values. But higher property values also means higher rents and housing prices, driving middle and low-income residents from the City. And again, such an assessment – if passed by Seattle voters – would certainly face legal challenges. (Note: it is clearly illegal under state law to use electric utility or water utility rates to support a broadband utility. Electric rates cannot even be used to provide streetlights, and water rates can’t be used for water flowing through fire hydrants). 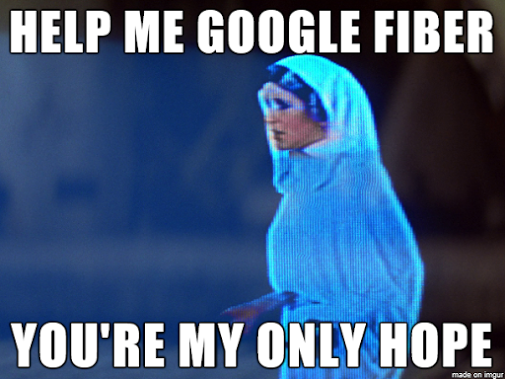 Provo, Utah, built a $39 million fiber network in 2004, but, unable to create a successful broadband utility, sold the network to Google for $1. UTOPIA, a coalition of suburban Salt Lake City cities, has $500 million in debt but no successful network. Content costs for a municipal network will be higher. The large cable companies have tens of millions of subscribers and, as mentioned above, often own or partially own content providers such as NBC or ESPN. Their wholesale rates for such content will be lower than the rates a city would pay. They can also extort payments from some content providers, such as Netflix, which recently agreed to pay Comcast so its movies and video would be delivered faster and more reliably. This “net neutrality” debate rages in Washington DC, but today provides additional income for incumbent providers. In Seattle’s case, many of these risks, plus the different business models, are clearly laid out in a 2011 study. Governments aren’t good at operating entrepreneurial businesses. Governments are great at police and parks and fire and water utilities. But providing Internet service is a business which has changed radically in the past 20 years, and will undoubtedly change radically again over the next 20. Is a city government nimble and flexible enough to enter such a marketplace? 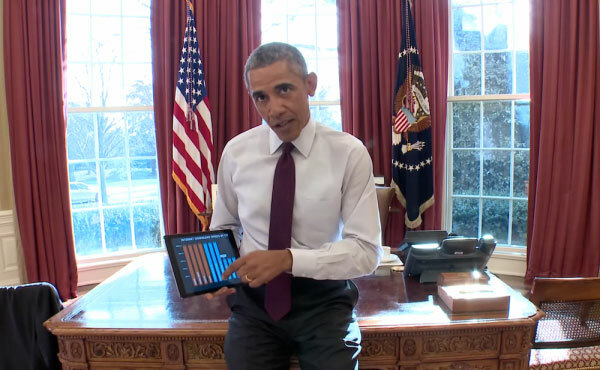 Municipal broadband has captured the imagination of Barack Obama and the Federal Communications Commission. It’s had some notable successes. Many Seattle consumers want an alternative to the existing monopolies. But is municipal broadband right for Seattle? Perhaps the next study by the Murray administration will find the right mix of politics and business to make it work.